Schwinn A10 vs Schwinn 170 Compared – The Big Match Up! 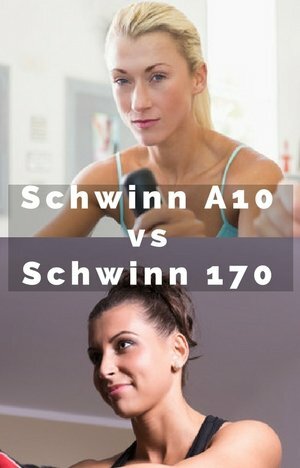 In this Schwinn A10 vs Schwinn 170 comparison they go up against each other. They have some similarities as they are made by the same company. By identifiying and looking at these they should answer the big question. Is the difference in the prices justified or not? The both sell fairly well and get good ratings overall from customers. Both do a good job in providing low impact cardio workout. Here is a quick review of each of the bikes. The Schwinn A10 Upright Bike is a bike that comes with a few extras above the affordably priced standard upright exercise bike. The console features is the main area of the extra with it having 6 pre-set programs, a media shelf and speakers. It is easy to use, provides good feedback and some variety for your workouts. It has 8 levels of magnetic resistance, drive belt and weighted flywheel that operate quietly and give a smooth pedaling experience. You can adjust the seat height to fit people between the heights of 5 ft and 6 ft. It is quick and easy to do, so the bike can be used by multiple users. The magnetic resistance transitions are smooth going from easy to moderately hard – making it suitable for beginners and those looking for up to moderately hard workout levels. This is one of the top 10 selling exercise bikes and it’s not just down to price – it’s not the most affordable bike with it priced over $200 but below $300 (at time of checking). But it does come with a lot of extras. It has 29 different workout programs to help you with your fitness goals and to keep you engaged. It has a charger for media devices, a media shelf, 2 backlit displays. speakers, fan and a water bottle holder. It has 25 levels of magnetic resistance, a drive belt a perimeter weighted flywheel to provide a wide range of intensity that is smooth and operates very quietly. The seat height and horizontal position can be adjusted to get the best fit for people between 5 ft and 6ft 1 ins. I’m focusing on the differences as they are likely where one bike is likely to score better than the other when weighing them up rather than similarities. As well as the facts there is a description as to what this may mean to customer in some cases. Despite the bikes being made by the same company there are quite a few differences to consider to help explain the price differential and also help you with choosing the bike for you. Workout Programs. In addition to a manual program The Schwinn A10 has 6 pre-set profile programs whereas the 170 has 12 of these programs. The 170 also has heart rate control programs, fitness and recovery programs. Heart Rate Monitoring. The Schwinn 170 can monitor your heart with a heart rate strap (needs t o be bought separately) or using hand pulse sensors on the handlebars. The Schwinn A10 only has the hand pulse sensors. Many people find that hand pulse sensors aren’t that reliable – they either give a wrong reading or they don’t connect properly. The heart rate strap makes for a more reliable way to get a reading of your heart rate. Seat Adjustment. Both bikes have seats that can have the height adjusted to get a good fit for the legs so you get a proper range of motion. The Schwinn 170 also gives you scope to move the seat horizontally to give you better positioning in relation to the handlebars. Display. The Schwinn 170 has two displays – one is 3 by 5 inches and the other 1 by 5 inches. Both are backlit. The Schwinn A10 has just the one display that is 3 by 5 ins – it’s not backlit and has less graphical display. The big advantage of the 170 dual format is that when you put a media device on the media shelf you can still see the smaller display whereas the A10 it covers up the display and you can’t see your measures. Resistance. The Schwinn 170 has a total of 25 levels of magnetic resistance with the Schwinn A10 having 8. Both bike’s resistance are controlled though the console either manually or automatically when following a program. The most important difference is how hard the top levels of resistance are. The Schwinn 170 goes up to a harder level where it should suit all but the those who want very tough workouts where as the Schwinn A10 is a more moderate level of intensity which most people find is enough to get the heart rate and sweat up- but more of steep slope than a hill. Measures. Both provide measures on time, rpm, distance, speed, calories, course profile, resistance level and heart rate. The 170 also shows an intensity measure, heart rate %, goal tracking and user. Accessories. They do share some of the same accessories – with both coming with a water bottle holder, speakers and media shelf. The 170 also has fitness account, USB port for uploading data and charging and a fan. Size. The Schwinn A10 is a much more compact bike needing only 27.5 by 19 ins of room making it easier for storing compared to the 41.3 by21.4 ins for Schwinn 170. Weight. The Schwinn A10 weighs 54.7 lbs and the Schwinn 170 weighs in at 62.8 lbs reflecting the added features. Fortunately both have transport wheels at the front so moving them around isn’t an issue. Cranks/Pedals. The 170 has the stronger 3 piece crank and oversized pedals. This provides an easier fit for your feet and the crank should be more durable and cope well with the additional resistance you can push against. Although there doesn’t seem to be an issue with durability and feet positioning with the A10 only having a 1 piececrank. Power. The Schwinn A10 can be powered by either 4 D batteries or a AC Adapter and cord – both of which have to be bought separately. The 170 can only be powered with AC Adapter and cord which is supplied with the bike. User Profiles. The Schwinn A10 doesn’t have any user profiles where you enter information, such as gender, age, weight that allows for more personal workout values and tracking of workouts. The Schwinn 170 allows you to set up 4 separate profiles allowing you to set up the information for 4 people which can also be used for uploading. Handlebars. The angle of the handlebars of the 170 can be altered to find the most comfortable position for you. There are also elbow pads that help support the arms when you lean on them so you don’t suffer pain on your forearms. Fitness Account. If you want to track your information and then the Schwinn 170 has more functionality allowing you to upload to the Schwinn Connect a/c and sync it with myfitnesspal.com for up to 4 people. It saves having to manually enter this information. When I checked the Schwinn 170 was about $80 -to $90 more than the Schwinn A10, although this can change depending on what deals are being promoted at the time. If you are wanting to monitor your heart rate and/or use heart rate control programs to train in zones then the Schwinn 170 has the much better option for this. The Schwinn 170 provides more features that should provide a more durable bike (it has a longer warranty with the frame being 10 years and the A10 being for 3 years) that can provide tougher workouts with a wider range of resistance- so for me this is the better option at where the price difference is at the present. But if you don’t want all those programs, don’t need resistance that goes past moderately hard and aren’t that interested in having separate fitness tracking then you can save yourself money by opting for the Schwinn A10. And it doesn’t make sense to spend more if you aren’t going to use the extra features. This table has the two bikes features, specifications and dimensions listed side by side to help you get a full picture of how these two bikes compare. Hopefully you now have the information to decide on which bike is right for you. It would be great to know what you’re thinking is between the two bikes.